JixiPix's Dramatic Black & White app starts by leaving color in the rearview mirror, and enables you to make expert adjustments with easy-to-use, fully customizable controls to contrast and light, texture and shape. Before your eyes, watch your photo transform into the dramatic looks of the past and cutting-edge styles of the present. Dramatic Black and White includes four tabs which you can use to customize your image. Tone Slider - Create a mood or add depth using the tone slider. Select a color then move slider right to tone the image. Soften/ Sharpen Slider - Move slider left for a dreamy feel or right to bring out details in the image. Contrast Slider - Increase highlights in the image and darken shadows. Move slider right to increase contrast strength..
Red/Green/Blue Sliders - Filters the image with the selected color range. B&W Strength - Move slider right to increases the opacity of the Black and White effect or left to blend the original color back in. Grain Strength - Add interest to the image by choosing a darkroom-style grain. Move slider right to increase grain opacity. Add Spotlight - Add a spotlight to the image - use multiple spotlights for a creative look. Resize the spotlight using anchor points on ellipses placed on top of the image. Remove Spotlight - Remove the last spotlight that was placed on the image. Spotlight Slider - Adds a darkened edge around the ellipse move the slider right to increase its opacity. Send To - Send To can be used to send your image to another app such as Mail, Facebook, Twitter, Instagram, etc. Save Preset - Adds your custom made preset to the Styles Tab also lets you name the preset. 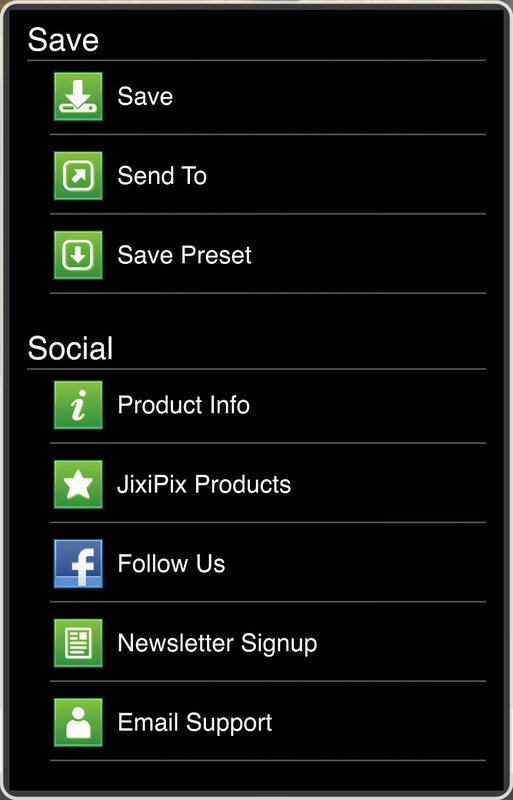 Jixipix Products - Takes you to the Google Play Store where you can view all our Apps available for your device. Email Support - Send us a support email using one of your email apps. Once you have applied a preset and modified it using the adjust tabs, you can save your own custom preset by using the "Share" button on the main screen and choosing "Save Preset" off the menu. Favorite a preset to move it to the front of the presets list for quick access. To favorite or delete a preset press down on a preset thumbnail and hold until an X and heart appears, tap the heart to favorite it or tap the X to delete it.